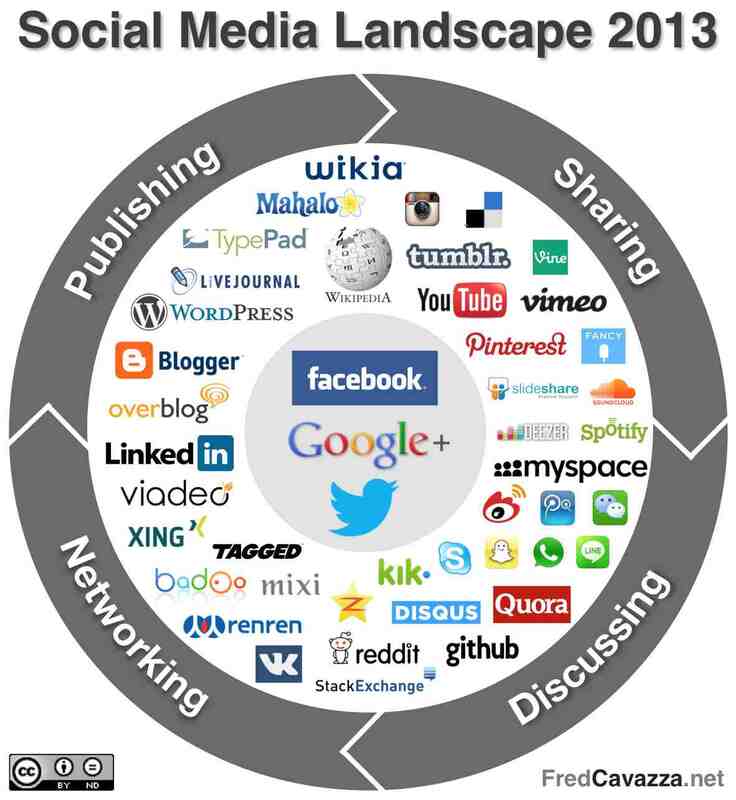 Every year for the last 5 years, I publish a social media landscape (see past editions from 2008, 2009, 2011 and 2012). I assume I won’t teach you anything by saying social media are now part of every day life of individuals, brands, organizations and media (journalists, celebrities, politicians…). Once considered with disdain, social platform like Wikipedia or Twitter have completely changed or way to consume and interact with information. Services like YouTube or Facebook also transformed the way we entertain ourselves. If you regularly read about social media, you should know how serious social media have changed the web. To make a long story short: the web is social media, and social media is the web. This being said, this shortcut does not translate the countless evolution of these platforms and the usage they generate. 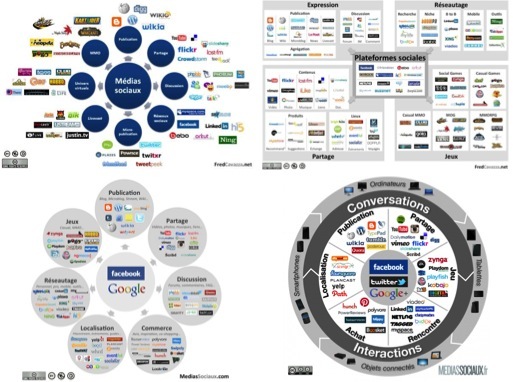 If the big players are still the same, social media are an expression and interaction playground in constant evolution. If 2012 was the concentration year marked by the buy-out of Posterous and Instagram, 2013 will be the year of diversification with the emergence of new comers, especially on mobile devices. But first things first, we shall begin with an analysis of trends. The 2013 edition of my landscape is therefore reduced from categories like « Playing« , « Buying » and « Localization« . Some players have been removed, but others have been kept as they try to reinvent themselves, like MySpace or Digg. Even if Asian internet users are outnumbering occidental one’s, mobile devices supremacy is the key success factors. I am deeply convinced that social media and mobility are two faces of the same coin: one’s success is benefic to the other. As it is a non-sense to envision social media appart from the web, mobility is one of its key component (There is no Mobile Internet). Twitter is working hard to be considered as a media with all the second screen initiatives, new cards system, the Vine mobile app and the upcoming Music service which begins to surface. Google is still stalking the others with a growing number of users (Google+ moves up to second place in social networks) and a constant flow of new features (communyties, sign-in, local reviews…). Enough with trends, lets now discover the new landscape. The latest version of the landscape has been simplified with four categories (Sharing, Discussing, Networking, Publishing) and enriched with foreign players (mainly from Asia). As you can notice it, there has been a lot of change in the Discussing area, especially with mobile-first new comers. Social media’s force comes from its diversity. Facebook act as a catalyst for this complex ecosystem, but it should have never been this successful without other platforms’ content and conversations. Therefore, social media have to be addressed globally, and not only Facebook which tends to mute « small » brands (smaller than Red Bull or Nike, i.e. 99% of brands). Teen’s attention is very hard to capture and to retain. If opening a Facebook profile is the first thing they do when entering high school, teens are quickly moving to mobile apps which does not leave trails of their interactions and where they can hang out together (without their parents or teachers). Facebook shareholders’ appetite for profits is limitless and they are slowly forcing Mark Z. to raise revenue without thinking of the consequences (Facebook Seeks 7-Figure Price Tag for Summer Debut of Video Ads). Being depend to Facebook for your social presence is a real problem, as the bill will undoubtedly increase. The sooner you will achieve a diversified presence on social media, the better. If the social media landscape appears to be stable, do not forget yesterday’s giant has fallen in a couple of years (MySpace, Friendster…). Therefore, everything is still possible, one just have to be creative. I won’t risk myself to provide you with a to-do list, as the subject is so complex. The best advice I can give you is to spend a minimum amount of your time following the social media field and trying new services, to better understand usage evolutions and to be able to identify trends and opportunities. I wish we’ll meet again next year for the 2014 update.